The A8 has been the pinnacle of the Audi range since the first generation version appeared in 1994 and has always brought the most sophisticated technology and the greatest comfort that the brand has to offer. 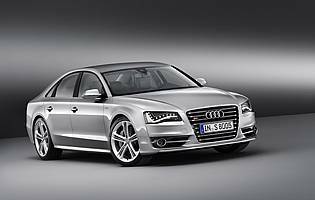 Following the introduction of the four-generation model in 2010, Audi has added a more sporting S8 version to the range. Audi's A8 has always been the most luxurious and comfortable car in the range, making it one of the preferred choices for high-flying executives around the world. Yet the German firm has always been a sporting brand, and it is expanding its range of 'S' models with the introduction of the S8 to combine performance and comfort in equal measure. The S8 sticks with the aluminium spaceframe chassis used on the standard A8. Although a complex undertaking for the manufacturer, Audi claims that it saves 200kg over an equivalent steel chassis whilst matching its rigidity and crash performance. That brings significant benefits to fuel economy and performance by making the most out of the available engine performance. Mechanically the S8 has air-suspension as with the rest of the range, plus the Audi drive select system, which gives the driver the opportunity to tailor the car to suit the driving conditions. 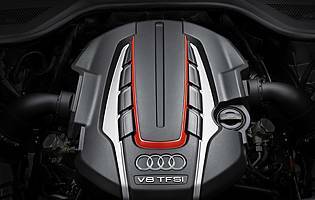 Under the bonnet it uses a brand-new 4.0-litre V8 petrol engine with a sophisticated twin-turbocharging system, replacing the naturally-aspirated V10 from the previous S8 model. The new engine manages to offer increased power and torque while achieving far superior fuel economy and emissions. The S8 appears broadly similar to the current A8 saloon bar a few subtle changes. On the outside it wears unique 19 or 20-inch alloy wheels, a single frame grille finished in platinum grey and understated skirts all round. S8 badges and quad exhaust pipes complete the exterior changes, whilst inside there are sports seats in the front and a very high standard specification. Audi has added a sporting edge to the A8 without sacrificing any of the comfort and convenience of the standard car. The impressive engine and transmission switch easily between cruising and sprinting, while the drive select system manages the suspension and steering wheel. Anyone seeking the ultimate performance saloon might prefer one of Audi's RS models, but the S8 will no doubt satisfy its wealthy owners.